29-Aug-14 Singapore digital health startup MyDoc, which offers a web and mobile service where patients can consult doctors online and easily share their personal health data, has secured additional funding. 28-Aug-14 India's Apollo Hospitals has launched an 'eAccess' remote monitoring system that allows one specialist to monitor 40 to 50 patients in its ICUs around the country from a central location, and help the onsite practitioners to take relevant actions in real time to prevent complications. 28-Aug-14 The belief that Western Europe and the more affluent parts of Asia will 'run out of' working age people in the coming decades is a myth. A significant increase in propensity to work beyond age 64 and the increased participation of females in these workforces means that countries such as Japan, Korea and Taiwan will in fact have more than enough workers. 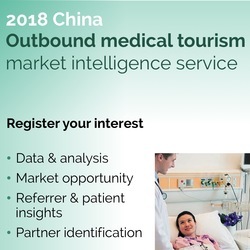 27-Aug-14 After piloting the first wholly foreign-owned hospital in the Shanghai Free Trade Zone, China's Ministry of Commerce has announced that foreign investors will be allowed 100% ownership of hospitals in seven cities and provinces. Both greenfield and M&A investment will be permitted.